Floating melodies, ocean surf, and gentle forest sounds bring you to rejuvenating sleep. 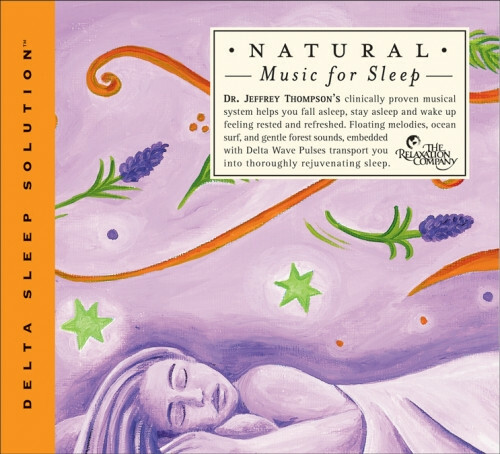 Dr. Jeffrey Thompson’s clinically proven musical system helps you fall asleep, stay asleep, and wake up feeling rested and refreshed. Floating melodies, ocean surf, and gentle forest sounds, embedded with Delta Wave Pulses, transport you into thoroughly rejuvenating sleep. Sleep is vital to our health and well-being. Yet millions of us don’t get the sleep we need to live healthy and productive lives. Simply listen to this clinically proven musical system at bedtime and fall asleep easily and naturally. In the deepest state of sleep, your brainwave patterns change to slow-frequency delta waves. Dr. Jeffrey Thompson has developed unique ways to embed these delta pulses into carefully crafted musical soundtracks. After a few minutes of listening, your own brainwaves naturally "lock" onto the delta pulses and lead you easily into deep, restful sleep. Dr. Jeffrey Thompson’s clinical research with thousands of patients has led to groundbreaking discoveries in how sound frequency patterns built into musical soundtracks can alter states of consciousness and induce mind-body healing. His audio programs are used by Fortune 500 companies, healthcare professionals, and individuals worldwide.